I’d first seen the enigmatic bassist Mick Karn in Los Angeles during his mid-80s tour with guitarist David Torn, drummer Bill Bruford and trumpeter Michael White in support of Torn’s critically acclaimed “Cloud About Mercury” album. One of the most memorable moments of that performance was Karn’s rendition of “Dalis Car”, a popular song from his days with Peter Murphy of Bauhaus and David Sylvian of “Japan”. Used to close each show, “Dalis Car” was emblematic of Karn’s compositional prowess and unique approach to his instrument. Sadly, after a long battle with cancer, Karn passed away on Tuesday at his home in London. Karn was born to a Greek Cypriot family of five, in Nicosia, Cyprus, as Andonis Michaelides, which was later modified to Antony Michaelides. In late October, of 1961, the family emigrated to London, England, when Karn was three years old. Karn was educated at Catford Boys’ School, Catford, South East London, and remained based in London until 2004, when he moved back to Cyprus with wife and son, remaining there for six years before moving back to London in late 2010. The band Japan, whose other members included David Sylvian, keyboardist Richard Barbieri and Sylvian’s brother Steve Jansen as drummer, began as a group of friends, who all studied at the same school. As youngsters they played music as a means of escape, playing Sylvian’s two-chord numbers – sometimes with Karn as the front man, sometimes with Sylvian at the fore. Guitarist Rob Dean joined the band later. The group would soon become known as “Japan” and in 1974, signed a recording contract with German disco label Hansa, and became an alternative glam rock outfit in the mold of David Bowie, T.Rex, and The New York Dolls. As the band started to achieve commercial success with the release of their “Tin Drum” album, and “Ghosts”, which reached the top five in 1982, tensions and personality conflicts between band members would signal the end of Japan. Tin Drum would be the Japan’s final studio album. Following the demise of Japan, Karn recorded a solo album before forming “Dalis Car” with Peter Murphy of the gothic post-punk group “Bauhaus”, who recorded one album in 1984. In 1986, he filled in for bassist Tony Levin on Torn’s “Cloud About Mercury” tour; performing first in Germany with Bill Bruford and trumpeter Mark Isham, and later on a tour of the U.S. with trumpeter Michael White, filling in for Isham. Karn continued to work with Torn on other projects, including Torn’s “Door X” album and alongside drummer Terry Bozzio. Karn and Torn would also continue to work with together with a number of Japanese musicians, forming the multinational New Wave band, “NiNa”. Since then he has worked as a solo artist and as a sculptor, photographer. Karn has also played on recordings by other artists, contributing bass guitar and saxophone to Gary Numan’s “Dance” album, and playing with Kate Bush and Joan Armatrading. 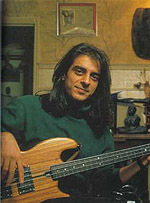 In the 1990s, Karn started the “Medium Productions” label along with Steve Jansen and Richard Barbieri, two of his fellow former Japan-members, and Debi Zornes. In 1993, Karn released “Beastial Cluster”, recorded with Torn, and fellow Japan members Steve Jansen and Richard Barbieri. Karn’s 1995 album “Tooth Mother” would feature Barbieri and the talented singer Natasha Atlas. In 2006, the MK Music imprint was established, as a three person operation—with Karn, Zornes and Mike Trenery—and beginning with 2006’s “Three Part Species”, all releases, including the autobiography, have the MK Music logo on them. In 2000, Karn worked with Gota Yashiki, Vivian Hsu, Masahide Sakuma and Masami Tsuchiya in the band “The D.E.P., or “Doggy Eels Project”. In 2001, he worked with Paul Wong on his “Yellow Paul Wong” release. In 2008, Karn released “Selected”, a collection of his music spanning some 13 years. Karn left London in 2004 to live in Cyprus with his wife and son, financially enabling himself to keep working as a musician/artist. In 2009 Karn also released his autobiography, titled Japan & Self Existence, available through his website and Lulu, which explores not only his music related life before, during and after Japan but his work in sculpture, painting, his childhood, relationships, and family. In August of 2010, Peter Murphy disclosed via video message on his personal Facebook profile that he would be reuniting with Mick Karn for a week in London, perhaps in November, to begin writing and recording for a second Dalis Car album. Murphy also added that this would be the first time the two had seen each other since 1983. One of Karn’s last recordings, “Concrete Twin”, was released last year and featured Karn performing on all of the instruments, save drums and percussion, supplied by Pete Lockett. In June of 2010, Karn announced on his website that he had been diagnosed with advanced-stage cancer; the specific type of ailment was not mentioned. According to Torn, Karn’s cancer had apparently already spread and he was undergoing chemotherapy. His website announcement stated that Karn had been struggling financially for some time, and appealed for donations to help pay for his medical care and provide financial assistance for his family. In addition, several people Karn has worked with, in particular Midge Ure, Porcupine Tree, and Masami Tsuchiya, had announced concerts in support of the appeal. According to a website update, the funds raised by the appeal enabled Karn and his family to move back to London where Karn could receive his treatment. Anil Prassad’s music website “Innerviews”, succinctly quoted Karn in a 1996 interview that summed up his approach to music. Essentially self-taught, Karn had nevertheless passed an audition with the London Schools Symphony Orchestra on bassoon; it’s theft forced Karn to to take up bass and led him to his partnership with guitarist Sylvian. “I rely very much on my ears”, said Karn. “If it sounds as if it’s the right thing, then I’ll keep it—even if it may not be…” Karn is survived by his wife and son. He will be sorely missed.